White Roses Carnations and Lisianthus arranged in basket. - This item is available for the delivery in Bangkok only. For proper delivery order must be placed at least 2 days in advance. - The type of ornamental flowers, leaves and associated materials may differ from the sample. It depends on what is available in Bangkok and the local flower shop in Thailand. 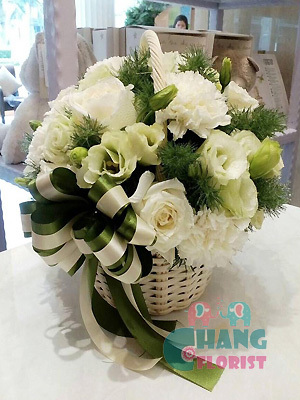 Our local florists in Bangkok and Thailand will try them best to do arrangement similar to example. To place order, please choose an arrangement option and then click on Add to Cart. You are able to get a higher number and better quality of flowers by choosing the deluxe or premium package.